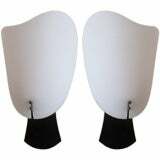 2-410, pair of double mirrored sconces. 2-411, pair of French brass starburst sconces. Take one 60 watt candelabra bulb. #2-424, a pair of swirled brass single light sconce. Newly rewired. 2-416, a pair of hand painted red leafy double arm sconce. Take two 60 watt candelabra based bulbs. Pair of Midcentury chrome sconces on a rectangle wall-mounted base with a curved decorative plate behind a single light socket. 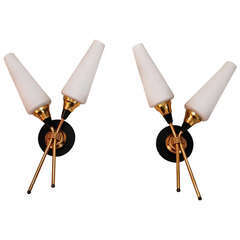 Midcentury Danish wall sconces with opaque white milk glass and wood frame. Newly rewired for hardwire installation without backplate. Backplates can be added, at additional cost. A large pair of Italian sconces of florid design with six lights each. In brass and painted tole. 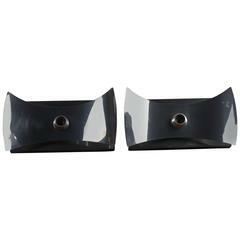 Italian gold leafed forged iron "branch" sconces, pair, 1960s. Take candelabra bulbs with or without clip-on shades. An outstanding pair of bronze sconces fashioned in the Russian Empire style. Elegant design and proportions.